A friend of mine brought me a bouquet of your iris and put them on my desk. Shortly after my head became stuffed up. As I was driving home my head cleared up just like that. I have purchased irises from you several times. They stuff me up, but I don't care, they are so beautiful. I m planning on visiting your gardens next year. In the meantime I'll place my order. I am willing to suffer through a stuffed up head In order to enjoy these beautiful iris. I just received my first iris order and I'm so happy!!! I took my invoice and went back to the website to get photos of the iris. If I'd taken the time to inspect the iris in the package, I'd have seen how wonderful Schreiner's is!!! They tagged all of them with pics and descriptions. So lovely!! I've used Schneiner's irises for a few years now. The roots they send are so healthy and blooms are always exactly like they are depicted on their site. I love how the irises upgrade the look of my gardens. First order ever of Iris! I found Schreiner's on Google and I ordered over $100 of tall bearded to be delivered by November. Then I had to dig the new area to plant them! This is NH and all that you find when you try to dig is granite, big rocks and little and sometimes ledge. I managed to create the bed and waited anxiously for the package to arrive. When i opened it I was amazed at the size of the roots and the healthy appearance of them all. They are in the ground now and I am praying for some rain since we are quite dry and need it before winter starts. I cannot tell you how wonderful those iris looked when they arrived. And I can't wait for spring to see the first blooms. Schreiner's is 100% the best place to buy iris and I can't wait to order more next year!! Thank you Schreiner's. I received my order of 76 iris in early September and planted them the same day. I was amazed at the quality of your product; very large rhizomes and very healthy looking. 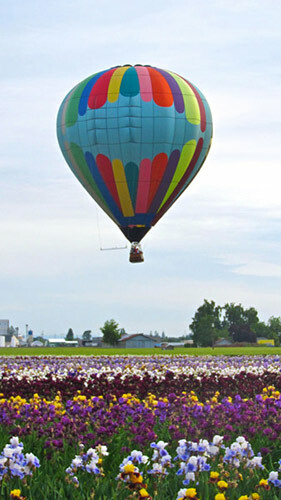 They are already taking off nicely and as we are going into winter I am looking forward to spring. There's one iris I adore over all the others I have from you and it is called Revere. Without a doubt it is one of the largest and most prolific bloomers of the many wonderful Schreiners iris I grow. This one I will never be without. Totally in love with "Revere"
Several years ago, I ordered nearly $500 worth of product (mostly Irises) from Schreiner's. I was so impressed with the quality of the product and the superior care taken in the labeling and packaging. I did have 1 item that appeared diseased and the company promptly, without questions, replaced that item. I have continued to enjoy the beautiful irises year after year. Their product is, in my opinion, the best on the market. Their customer service is excellent as well. I look forward to adding to my iris collection, with Schreiner's as my company of choice. The finest display of iris anywhere. The friendliest people waiting to help with an order. Iris rhyzomes of the finest quality. Packed and shipped with care. I couldn't be happier. Last year, I bought 51 different varieties of Iris - over 40 of them from Schreiner's. Every morning I walk out front to my garden to find out what has bloomed or is about to bloom. The flowers are gorgeous. Only one iris failed to come back after a cold winter here. I called your customer service and it is being added to my 2018 collection. Thanks for your great customer service. Your representatives are always courteous and friendly and helpful. I will only buy from you --- oh, maybe if one strikes my fancy at a local nursery. My sister bought these for my 60th birthday almost 2 years ago. This year they are all in their glory and beautiful. I have been ordering TB iris from Schreiner's since the mid-1970s, about 100 varieties in all. I have always received large, healthy rhizomes - unlike some from other mail-order suppliers I have tried. Some varieties, such as Best Bet, Brazilian Holiday, Beverly Sills, and Supreme Sultan, have greatly exceeded bloom and/or vigor expectations here in my southern Ohio garden. I also appreciate your informative catalog and website copy and photos, especially since I am far from your gardens. Thank you for writing. The situation as you have described it sounds very much like either weather or soil related. If there is a sudden cold spell during the time that the buds are forming, the bud development can be impeded. If there is too much Nitrogen in the soil, the Iris will produce foliage but will struggle with flower development. Because the rhizomes are healthy, per your information, the plants are sound and will likely fair better the second bloom season. Use caution when fertilizing. We always recommend a low Nitrogen fertilizer. Do no apply bark dust around the plants, as this can leach too much Nitrogen into the soil. Ensure that the Iris receive at least 6 hours of sun per day, and that the soil drains very well. In 1994 in AZ we bought our first house where I could garden. I bought quite a few of your gorgeous Iris and had to learn about "reverse" seasons of growth and bloom in southern AZ. Here it is 24 years later now in northeastern Nevada, and I have carried and moved at least one rhizome from each color of my original purchases to 5 different houses! I'm ordering more this year and want you to know how vigorous and hardy these beauties have been for me! I have ordered from Schreiner's consistently since 2015, and have never been disappointed with quality or service. Every rhizome has been true to name and has been extremely hardy. They've survived flood, drought, rot and scorch and they just keep going. I order from all over the country, but Schreiner's will always be on that list! As usual the new iris plants are great. Live in Midwest so takes awhile to get here. Ordered some new lilies this year. Larger plants than most. Usually one or two fans. Smallest plant is 4 fans. Definitely reorder. Thanks again. Can't wait to see them bloom. Love, Love, Love my Irises!! I just started gardening this year and wanted to plant some irises! So, I purchased 10 Rosalie Figge rhizomes from Schreiner's Gardens and planted them at the beginning of August - just hoping I did everything right! I wasn't expecting anything this year since they were just separated, shipped and newly planted 4 weeks ago. But, yesterday 1 of them bloomed! And I have 2 others with buds and the rest with leaves that have begun to grow! I wish I could submit a picture because it's absolutely beautiful!!! Huge rhizomes! Very healthy plants and roots. Wonderful packaging. Although they were unable to give me a couple of irises due to a crop issue, they did not replace them with something I did not ask for. Instead they gave a refund. Will plan on purchasing from them again. I have been working on making my back yard garden (which is just about my entire back yard- my wife complained that all the grass is gone!) self perpetuating. I had never thought of iris as a major part of that until I looked at what is available at Schreiner's. I had no idea that there are so many incredible iris. The colors are astounding. And the reblooming part means another round of color during our growing season. (zone 6). I wish Monet would have had these in his garden! Day lilies have been a favorite of mine after I figured out that you have to plant them so the sun is not pointing them away from you. I have a nice collection of "usual" repeaters. When I started looking at the plants available at Schreiner's, it was like another world opened to me. I still cannot believe all of these incredible plants exist and I had never seen them before looking at Schreiner's this year. And to top it off, I got "Griselda" as a bonus plant [with my order]. This one sells for $65 which is in the price category out of my league. It is so beautiful I may have to look at the high priced plants to find a splurge on occasion. ordered 5 new lilies 2 of them are blooming! It's 9/15/18! Love them. I recently became a customer for the first time. I am so impressed that the irises I planted just a couple of weeks ago here in NC are already showing new growth. So much better than irises I purchased from another company. You have gained a loyal customer. Can't wait for spring to see my blooms. I ordered iris from you and Cooley's 20 years ago. My tastes have changed to day lilies. So I had to give y'all a try. Schreiner's with Mariott as the hybridizer has his newer varieties at the best price. Even though the shipment had to travel almost to the right (East) coast, the ones I received were healthier and larger than the other two companies I ordered from. Little things like rubber banding loose rhizomes together make you the best. One company had loose rhizomes with no label and another did not have a variety true to name. You also gave a generous bonus. I will be checking online until next year's 'catalog' is available. My family has been buying iris from Schreiner's since 1949 or before..always got good quality plants, polite service, beautiful blooms.. it's the best place to buy Iris. I live in Dallas TX. I have been planting your irises in my yard for 16 years. They usually burst into bloom late March through late May. I was diagnosed with metastatic renal cell cancer in late 2018. I started treatment at MD Anderson in Houston on Jan 9, 2019. 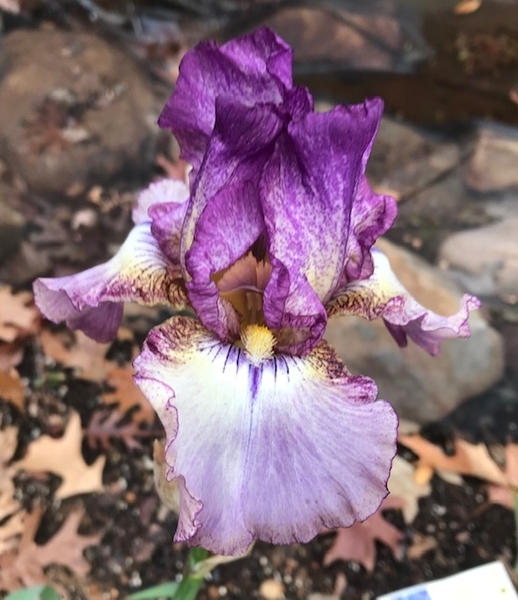 On Jan 6, 2019 I found my Schreiners Iris, Autumn Tryst, which I had planted in Fall 2018 in bloom. 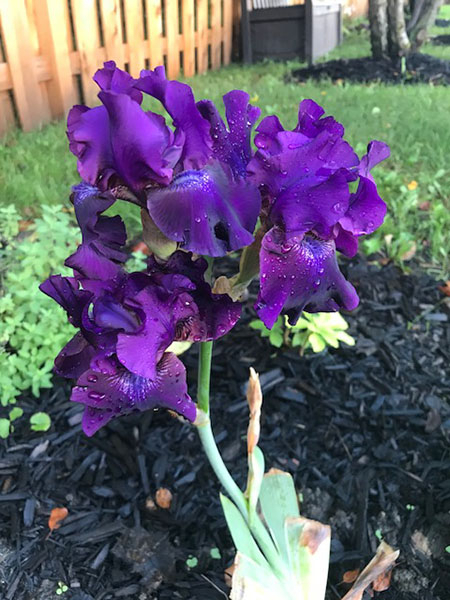 What a wonderful reminder of how blessed I was when I was greeted before my journey with one of your beautiful irises in bloom. I have never before had an iris bloom this early. For the last forty five years I have enjoyed a passion for the simplicity of the iris bloom. This started one Motherâ€™s Day in1975. On my way back to Bend I stopped in at Schreiners Iris gardens. 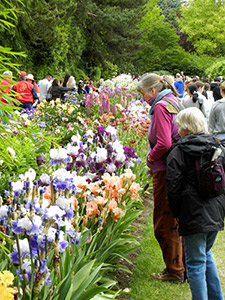 I was amazed at the beautiful gardens and only twenty five I still spent $80 on irisâ€™s I saw growing in the gardens. That day Mr. Shreiner took time to explain the process of developing the varieties of irisâ€™s I saw in the garden that day. In thirty short minutes he passed on his passion to me. Each spring when my irisâ€™s start their climbing to blooming I remember the gardens and the author of much of the greatest I enjoy.